The Asus ZenBook Pro 15 is an immensely capable, swift and powerful desktop replacement with an innovative ScreenPad that offers immense potential though it does not come cheap. Unveiled at Computex a few months back, the Asus ZenBook Pro 15 is intended as the ideal rig for content creators who need portable hardware capable of tackling heavy pixel crunching duties. Rather than persuading buyers purely on its already impressive stat sheet, the ZenBook Pro 15 adds in an unusual feature – the ScreenPad touchpad. Rather than create something that requires mastering a new set of motor skills or an entirely different workflow, the ZenBook Pro 15’s ScreenPad adds in a 5.5-inch matte 1080p resolution touchpad inset at the base of the keyboard that works like a normal trackpad but which can also act as a secondary display that can run a modicum of handy apps too which we’ll cover in more detail later on. Externally, the ZenBook Pro 15 sports an all metal chassis done up in a shade of what they called Deep Dive Blue finished in gold trim, which lends it a touch of class. The notebook is a significant step up in terms of its build quality, finish and polish from its more mainstream VivoBook cousins that we reviewed a while back. Alas, It’s not the lightest notebook that you can tote around at 1.86kg but it is one of the slimmer ones, helped in part by its tapered bezels which are 7.3mm thin at their slimmest point and its overall svelte silhouette at 18.99mm; quite an achievement seeing how much hardware it packs under the hood. The top lid has a concentric brushed metal finish centered around an Asus logo emblazoned in the centre. The underside is otherwise unmarked save for a quartet of rubber friction pads and two subtly emplaced downward-firing stereo speakers tuned by Harman-Kardon. While the finish and gold trim do give it a posh look, it’s also a fingerprint magnet which requires frequent wipedowns and casual handling leaves streaks on the chassis unless you’re in the habit of wearing gloves when you work. The hinge itself opens smoothly and allows for the display to be angled at about 135 degrees or so which should be able to accommodate most viewing angles. It is also remarkably sturdy with nary a bit of wobble. Once you set it at the viewing angle you want it to be, it’ll stay there barring deliberate intervention. There’s quite a bit of initial resistance when the top lid is fully closed though so you’ll need both hands to flip the notebook lid open. Of note is the sturdiness of the top lid that has no bend or play. Popping the lid open reveals the beautifully appointed 15.6-inch 4K resolution touchscreen framed within relatively thin bezels as well as an island-style keyboard with a fingerprint reader inset in the lower right of the wrist pad, a power button inset in the upper right corner of the keyboard and the ScreenPad touchpad itself. Unlike the exterior finish, the interior, in particular the wrist rests and the area surrounding the keyboards is made of a matte finish that resists fingerprints better than the exterior chassis. In terms of ports the ZenBook Pro 15 has quite a generous selection available, which should endear it to most content creators. The right side comes with an audio jack, a pair of USB 3.1 Gen 2 ports and quaintly enough, a microSD card reader. A full sized SD card reader would have been welcome but it’s not an insurmountable issue to simply acquire microSD cards with an SD card adaptor for use in cameras and the like. The left side comes with a port for juicing the notebook, a pair of Thunderbolt 3 USB-C ports and a HDMI port. Assuming you have fairly deep pockets, the ZenBook Pro 15’s two USB-C Thunderbolt 3 ports allow for you to output additional feeds to two separate 4K UHD monitors which makes it handy for video editing and other creative work. As far as build quality is concerned, you won’t be left wanting here as the whole affair is sturdily built without the characteristic flimsiness seen in cheaper notebooks that liberally use plastic for the chassis. The weight of the ZenBook Pro 15 will affect its portability somewhat though this is tempered by its slimness, which makes toting it around in your backpack for short jaunts at least something worth considering. What’s this ScreenPad about then? Essentially, the ScreenPad is a 5.5-inch Full HD resolution display emplaced where the usual trackpad would be with touch capabilities that can double up as a secondary display as well as an extension of selected productivity software. 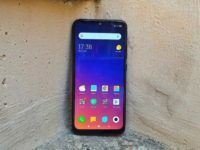 It also has the capability to independently run a selected array of essential apps like your calendar, the built-in calculator, Spotify, the built-in music player and YouTube. The ScreenPad itself is sheathed in glass with a matte finish and has an exceptionally smooth glide though it’s not very clicky nor does it have any haptic feedback though this is a minor quibble at best. In terms of options, you’re able to use the ScreenPad as a normal trackpad with the display off, use it in ScreenPad mode where you get to use it as both a trackpad and to operate your music player, Spotify and manipulate YouTube playback along with access to your calendar, calculator and sundry other apps. At present, only a small number of third party apps work natively with the ScreenPad in some fashion such as the Microsoft office suite which offers you access to several handy shortcuts. You’re also able to use it to digitally sign your signature in lieu of a touchpad via Adobe Sign. The clincher and the centrepiece of the ScreenPad though is its Extension Display mode where you can use it as a smaller secondary display. Extension Display mode is where the ScreenPad truly shines as you can use it as a secondary screen for whatever you desire – including playing games or just to stream a video while you get some serious work done on the main screen. The ScreenPad allowed for some serious multitasking that we’ve never explored before and we’re loving it. We’re able to work on a full spreadsheet in the main display while binge-watching Agents of Shield on the ScreenPad as well as catching a round or two of Far Cry 5 and Enter the Breach too though the modest size of the ScreenPad better lends itself to turn-based or slower paced games rather than full-on firefights. According to Asus, they’ll release the SDK later down the line so there’s quite a bit of potential as to what savvy developers can do once they get access to what makes the ScreenPad tick. If developers can use that secondary screen for additional functionality in some form or fashion much like what the Nintendo DS does and what MS Office Suite has done, this may just become a mandatory feature in future notebooks. If they can get Google Docs can work with this, we’re sold. At present, it’s a subtle but effective way to expand the functionality of the ZenBook Pro 15 but it will take time before it reaches its full potential. The Asus ZenBook Pro 15 comes in three different configurations for the Malaysia market. Our test unit, designated as the UX580G-EE2030T represents a middle ground between the entry level and highest end variant though its stat sheet is just a notch or two down from the top-tier configuration. For RM8,899, you get the aforementioned 15.6-inch 4K UHD touchscreen, an Intel Core i7-8650H 2.2GHz processor based on Intel’s recent Coffee Lake architecture that is built on a 14nm process, 16GB DDR4 2400MHz RAM, an NVIDIA GTX1050Ti graphics card and a huge 1TB PCIe solid state drive. Of particular note is the ZenBook Pro 15’s touchscreen display as it has been specifically designed to cater to content creators. According to Asus, the 4K UHD panel has been Pantone validated, which means colours will appear as they should be if you’re creating content and the screen offers 100% Adobe RGB and 132% sRGB coverage for the colour gamut. To ensure colour accuracy, the notebook has an exceptionally low Delta E value (Delta E < 2) to ensure colours are spot-on. All these sterling qualities make it exceptionally ideal for both photo and video editors who depend on absolute colour accuracy for their work. Add in the ability to port out a feed to two other 4K monitors and you have the makings of a highly portable work station. All this hardware enables the ZenBook Pro 15 to tackle demanding tasks like video rendering work. Fortunately, all its pixel crunching capabilities also make it a dab hand at gaming too. 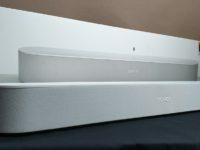 The downward firing Harman Kardon tuned speakers were pleasantly loud and detailed without distortion even when cranked to maximum volume though the nature of their design means that they work best on a hard surface for the sound to bounce off of. The keyboard itself is fairly comfortable to use as notebook keyboards go with a decent 1.5mm of key travel though it lacks a numeric keypad which is a decidedly minor quibble seeing as you can assign the ScreenPad to double as one in a jiffy. It takes a bit of practice but typing out large tracts of text isn’t a problem once your muscle memory gets used to the tactility of the keyboard. In practical field tests, the notebook was able to handle about two dozen open windows in Chrome without pausing a beat even while Netflix was streaming in another open window. Everything asked of it, including an extended session of Far Cry 5 on High settings was handled with deft aplomb. When rendering a Full HD video in Magix Movie Edit Pro, it accomplished the task in minutes. In the field, the ZenBook Pro 15’s monitor served up lusciously beautiful colours and amazingly pin-sharp detail along with wide viewing angles though the glossy nature of the screen means that it is best used indoors. These capabilities were borne out when the ZenBook Pro 15 was subjected to synthetic benchmarks. 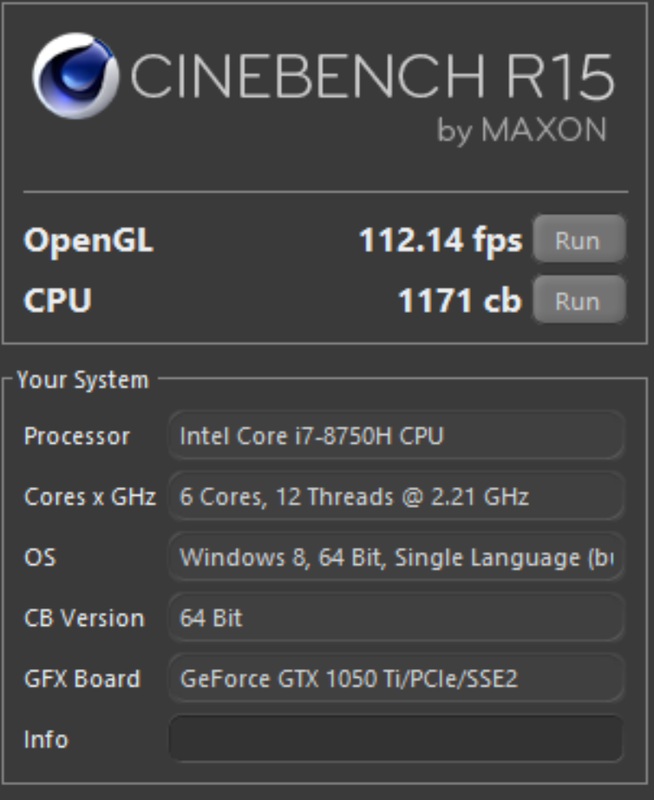 In CineBench R15, it got an OpenGL score of 112.14 fps while the CPU garnered a score of 1,171 cb. In PCMark 10, which tests for a notebook’s capability at performing work related tasks, it earned a very respectable score of 4,603. In 3D Mark’s TimeSpy, it got a score of 2,441. To keep things cool, the system has a pair of cooling fans inset in the underside of the chassis. Fortunately, they’re fairly quiet and even under heavy loads it was fairly silent save for a short whirr as they revved up to handle the increased heat though in casual tasks like word processing and web browsing the notebook is otherwise silent. That notwithstanding, this notebook is a very respectable performer indeed though it predictably falters in the one spot where high-powered notebooks usually do – battery life. Seeing the fairly hefty hardware that the ZenBook Pro 15 is running under the hood, battery life is predictably going to be on the modest side of things. On paper, Asus has stated that the 71Whr 8-cell lithium polymer battery is able to last about 9 or so hours of work but this is a rather generous estimate at best. If you dial down screen brightness and limit your work to fairly basic web browsing and paperwork along with WiFi and the ScreenPad activated, the notebook lasts about six or so hours. In more realistic scenarios, you’re looking at less than four or so hours of heavy duty usage before needing a plug point. Fortunately, the power brick is modestly sized and fairly light which makes transporting for work in the field a palatable option. 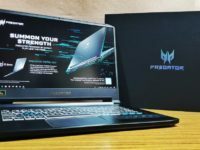 In terms of performance, the ZenBook Pro 15 delivers on all fronts as an excellent portable rig for content creators and, in a pinch, gamers too though that is not where its focus lies. The integrated ScreenPad is an innovatively useful feature indeed with tons of potential though there’s a learning curve involved before you can fully master its capabilities and its still early days as its full potential has not been unlocked as yet. If you’re a serious content creator, the mid-tier ZenBook Pro 15 UX580G-EE2030T is an immensely capable acquisition that can tackle everything asked of it including 4K video rendering work though those with deeper pockets may opt for the most powerful variant that has an Intel Core i9-8950HQ processor running the show for RM10,999. Should you desire for something a bit more affordable, you can opt for the cheapest variant, the UX580G-EE2030T that retains the same crisp 4K UHD display and ScreenPad but trades the processor in for a slightly lower end but still very capable Intel Core i7-8750H along with 8GB RAM and a 512GB PCIe SSD for RM5,599. We say The Asus ZenBook Pro 15 is an immensely capable, swift and powerful desktop replacement with an innovative ScreenPad that offers immense potential though it does not come cheap.